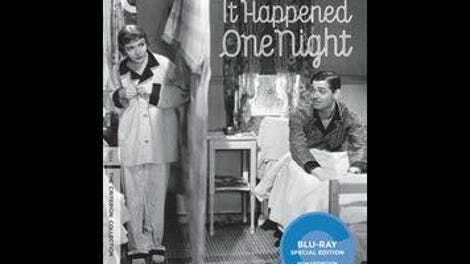 Despite having been released just a few years after Hollywood made the transition from the silent era to talkies, Frank Capra’s It Happened One Night was by no means the first dialogue-driven, banter-heavy romantic comedy. Nor is it necessarily the greatest romantic comedy of all time, even though it won the 1934 Oscar for Best Picture (then called Outstanding Production)—one of the few romantic comedies ever to do so. The distinction it can claim is more impressive than that: It’s every goddamn romantic comedy you’ve ever seen. They can all be traced back here, virtually without exception, for eight straight decades now. Technically, the film has never been remade, but that’s largely because, in spirit, it has never stopped being remade. Something so perfectly structured can support nearly endless variations. It’s timeless. Here’s how the genre was encoded. 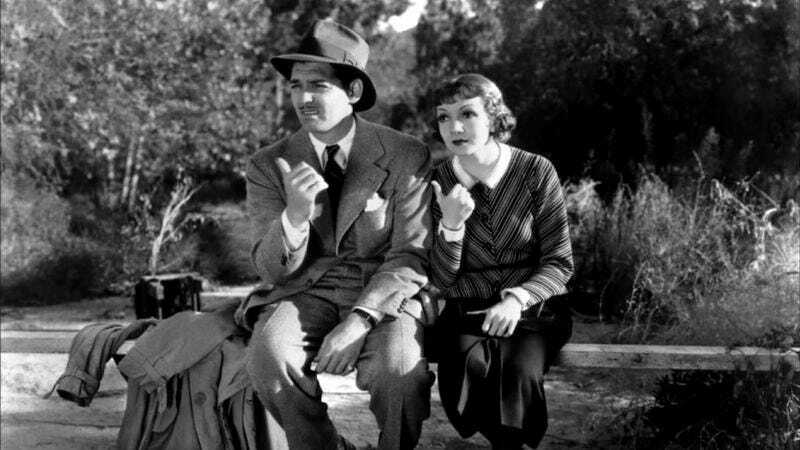 Enraged that her wealthy father (Walter Connolly) is trying to prevent her marriage to a foppish aviator (Jameson Thomas), spoiled socialite Ellie Andrews (Claudette Colbert) impulsively jumps from a yacht near shore and goes on the run. While traveling incognito by bus, she encounters arrogant, unemployed reporter Peter Warne (Clark Gable), who quickly recognizes a big story in the making. Since the clueless Ellie has had her bag stolen, along with all of her money, Peter offers to help her get to her fiancé in New York in exchange for an exclusive once she arrives. Along the way, however, while awkwardly sharing a room at various motor hotels—Peter repeatedly constructs a flimsy barrier between the twin beds, which he dubs the “wall of Jericho”—the constantly bickering couple gradually falls in love. Ellie no longer wants to marry the aviator, and Peter no longer cares about the story, but a late-breaking misunderstanding threatens to set them back on their old paths. Like any movie made 80 years ago, It Happened One Night features various elements that now feel dated—not in a bad way, just in the sense that they would need to be rewritten for a contemporary audience. One of the film’s saltiest bits, for example—it was released just a few months before the infamous Hays Production Code went into effect—sees Peter intimidate Ellie onto her side of the newly erected wall of Jericho by proceeding to undress in front of her, narrating the process as if he were shooting a documentary on the subject. (Legend has it that sales of undershirts plummeted when Gable pulled off his top shirt to reveal only his bare chest.) Jennifer Aniston would just raise an eyebrow as Gerard Butler’s trousers drop, not scurry behind a barrier in alarm. In its broad strokes, however, this film plays exactly like its distant descendants now do. All the ingredients are there: arrogant man, defiant woman, one or more boring rivals, some logistical impediment, shared adventures with optional cross-country road trip, a gradual thawing, and a miscommunication that threatens to scuttle this new romance at the last minute. If only today’s versions of this perennial possessed a fraction of the original’s verve and charm. Reportedly, Gable was bored out of his mind on the set, and Colbert was convinced she was stuck in one of the worst movies ever made. All the same, the two are ideally suited for each other, perhaps because each of them seems so self-sufficient. Capra and screenwriter Robert Riskin (adapting a short story “Night Bus” by Samuel Hopkins Adams) do a superlative job of constantly shifting the balance of power, which is always the trickiest aspect of any war of the sexes; the film comes alive during a scene in which Peter and Ellie jointly improvise a little mini-drama designed to disguise Ellie’s identity from some private detectives hired by her father. Even the famous hitchhiking bit, best remembered for Colbert’s flash of leg, is really a duet, as the punchline only works because Gable does such a hilarious job of selling Peter’s three allegedly foolproof methods, desperately cycling through them again and again as a string of cars barrel past. The two of them make it look easy, but decades of pale imitators prove that it’s anything but.